Holiday Cookie Tree & Hassle-Free Party with Chick-fil-A Catering Menu Items Disclosure: I am a member of the Chick-fil-A Mom Panel 2015-16, I was selected to participate in the 12 Days of Gatherings Catering Campaign. I received a Chick-fil-A gift card to purchase items to facilitate my post. As always, all opinions are my own. I am a huge fan of Chick-fil-A food, embarrassed to admit I visit my neighborhood Chick-fil-A restaurant several times a week. I tend to order the same thing from the menu each time I visit. I can honestly tell you I have never ordered from the catering menu until now. I was like a kid when I was looking through the catering menu online. 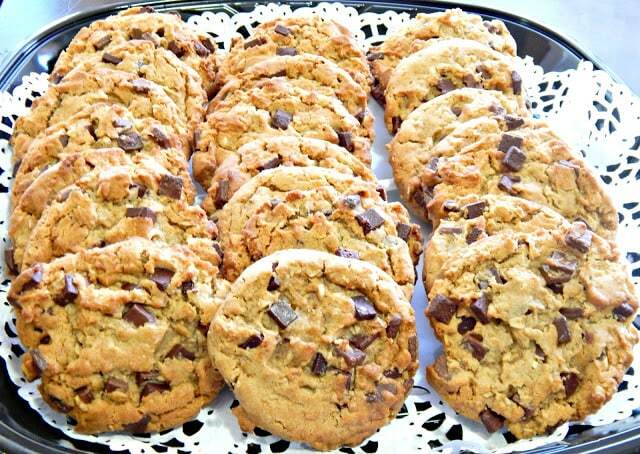 My eyes lit up when I saw the tray of chocolate chip cookies! I have always heard wonderful stories about Chick-fil-A’s cookies but for some reason, I have never tasted them. 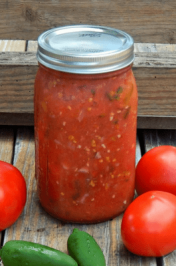 When I found out I was selected to participate in the 12 Days of Gatherings campaign I was excited I couldn’t wait to brainstorm about what I would make, except that didn’t happen. As soon as I saw those huge chocolate chips cookies on the catering menu, all I could see were cookies hanging from a tree. Sounds funny I know, it’s the truth, though. Chick-fil-A makes it super easy to order from their catering menu with several options to order. 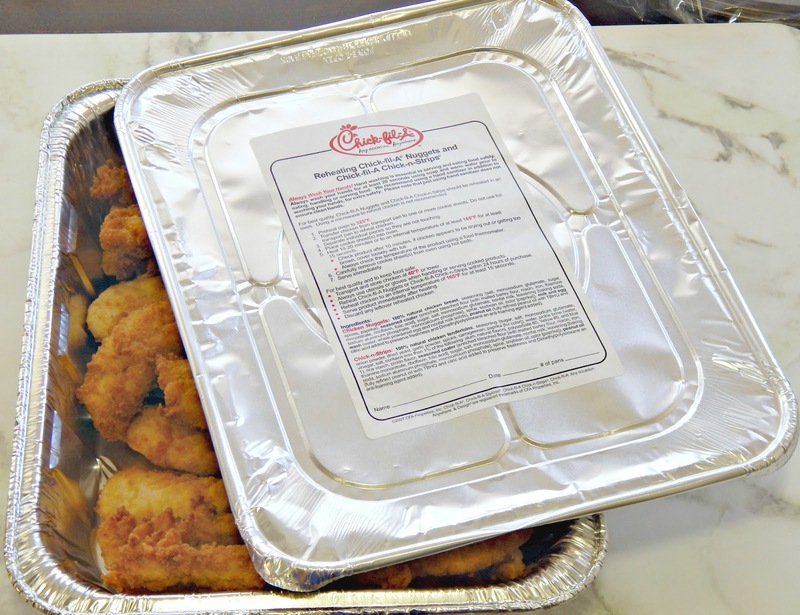 You can place an order from their catering menu online, call your local Chick-fil-A to place an order over the phone, or visit your local Chick-fil-A restaurant to place an order in person. They offer something that will appeal to everyone’s taste buds. And, I love the idea of having catering trays of food from Chick-fil-A instead of preparing everything for a holiday party myself. I decided to make a Cookie Tree. Every Christmas Eve my husband and I host a Christmas Eve party for our family and friends at our home; usually, there are lots of children running around. I thought it would be fun to give each child at the party a cookie to take home to put out for Santa Claus. I ordered the 24 count, cookie tray. If you have never tasted these gooey chocolate chunk cookies, you are in for a treat. T0 make the Holiday Cookie Tree you need 12-24 chocolate chip cookies from Chick-fil-A, plastic cookie bags, green and red ribbon, a hole puncher, white paint, plaster of Paris, a flower pot, tape, and a tree branch. You could make several cookie trees to place out around your party if you wanted. I think the cookies hanging from the tree like ornaments look festive. 1. Cut and remove leaves and dirt from a tree branch. 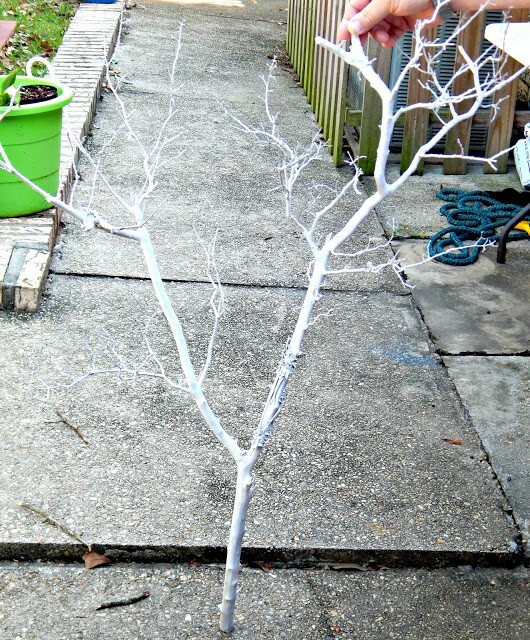 Paint the branch with white spray paint and let dry. 2.Once the branch is dry, prepare the plaster of paris in the flower pot that you plan on using as the base according to the directions on the container (I suggest using a flower pot bigger than mine) the plaster of paris should be the consistency of peanut butter. Fill the flower pot almost to the top, work quickly because the plaster of paris dries fast. Stick your branch into the plaster of paris in your flower pot making sure it’s centered, hold the branch in place for a few seconds until the plaster of paris is firm. 3. Place each cookie in a plastic cookie bag, fold the bag shut and tape close. 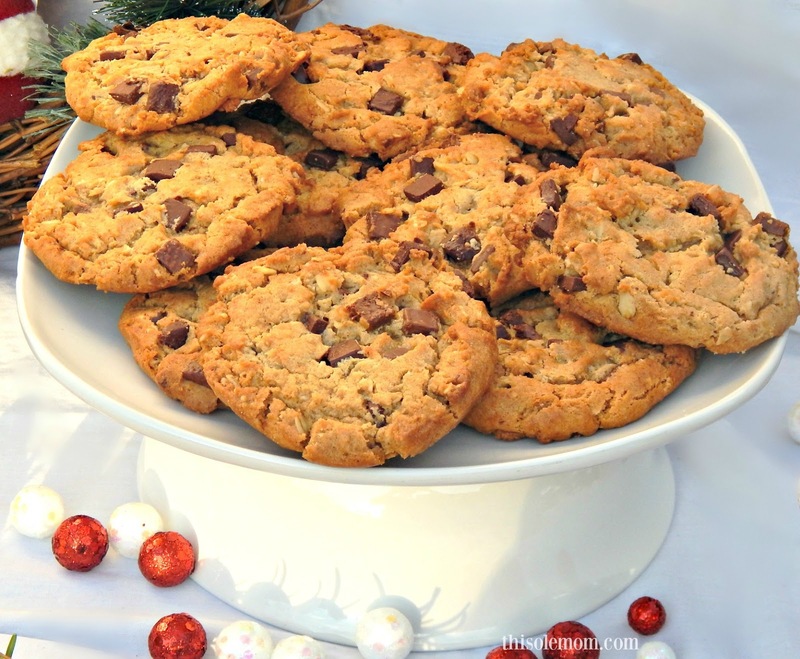 Use a hole puncher to put a hole in the top of each bag with the cookie in them. 4. Put ribbon through each hole of the cookie bags. Kim’s note– I used a chopped stick to push the ribbon through the holes. 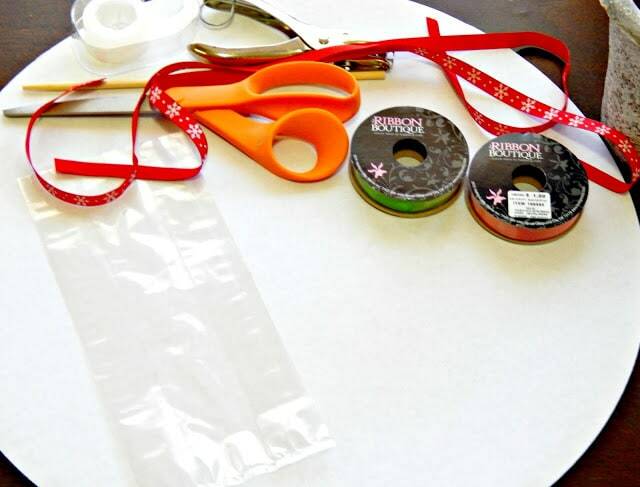 Use something with a pointed end to push the ribbon through the holes. 5. 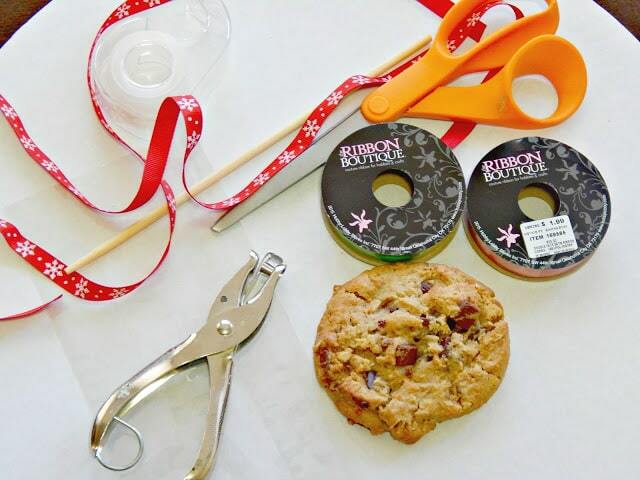 Make a loop with the ribbon and tie a bow to hang each cookie ornament from the cookie tree. 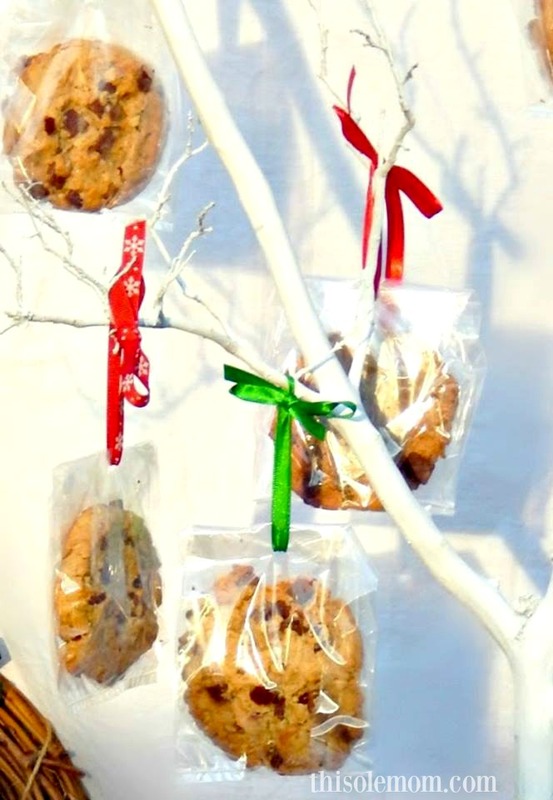 Hang each cookie from the tree. The Cookie Tree becomes a beautiful focal point. 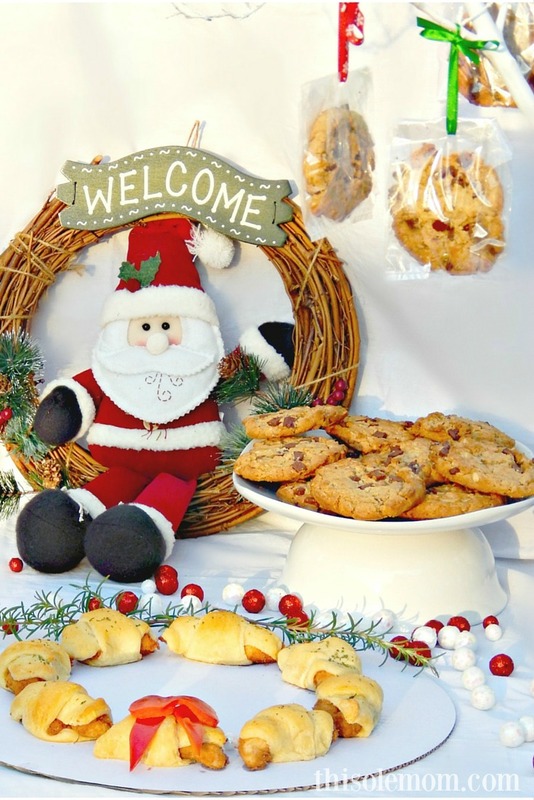 When decorating for a holiday party have fun with the food and decorations. The best thing about having Chick-fil-A cater your holiday parties is all you have to do is pick up the food and go home and set it out. You can pick up your catering menu items hot and ready to serve or have them chilled and reheat them later. I had my trays prepared ahead of time, so they were cool when I picked them up. You don’t want your cookies hot when you place them in the cookie bags. I also bought a Chick-fil-A Chicken -n- Strips Tray. I picked up my tray chilled so I could reheat them later. Just follow the directions to reheat the chicken strips on the container they come in. The chicken strips come with your choice of dipping sauce. I decided to make a wreath using some of the chicken strips. Note– the wreaths would be cute to make several to place out around your party. Just adjust the ingredients accordingly or double the ingredients to make the wreath bigger. Preheat oven to 325 degrees. Unroll the Garlic Butter Crescent Rolls and separate. Wrap one triangle piece around each chicken -n- strip. Place the wrapped chicken-n- strips on a cookie sheet, bake until golden brown about 15 minutes. Remove from the oven. Melt butter in the microwave in a glass bowl and mix garlic powder into the butter. Once the crescent rolls cool place on a platter in the shape of a circle.Next, use a pastry brush to brush on the garlic mixture, then sprinkle lightly with parsley. Cut a bow from the bell pepper and place on top of one crescent roll. 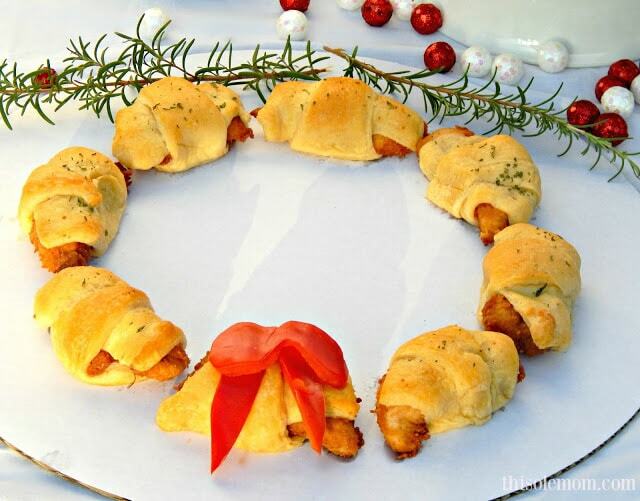 Use a few pieces of rosemary to decorate your chicken strip wreath. If you don’t use all the Chick-n-Strips to make a wreath warm up the remaining strips according to the package, and serve them with your favorite dipping sauce from Chick-fil-A. Have you ever tasted Chick-fil-A’s Chick -n-Strips? I love these delicious mouth-watering strips cut from the tender part of the chicken breast. 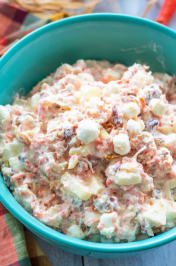 I think your guest will thank you if you serve some at your next holiday party. 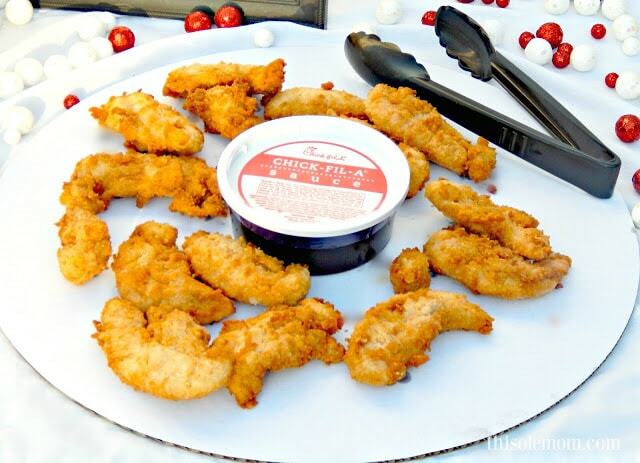 I hope my ideas using Chick-fil-A catering menu items help you have a fun and hassle-free holiday party. Do you order from Chick-fil-A for the holidays? HOW CUTE! I love this idea. What a great centerpiece for a party. Great job! A COOKIE TREE? How stinking' cute is that?! I love it! BTW, I've never ate Chick-Fil-A! I might just have too! What a fun idea! We love Chick-Fil-A but never used them for catering or anything like that. Great idea there too! Woot! I'm all about that cookie tree. 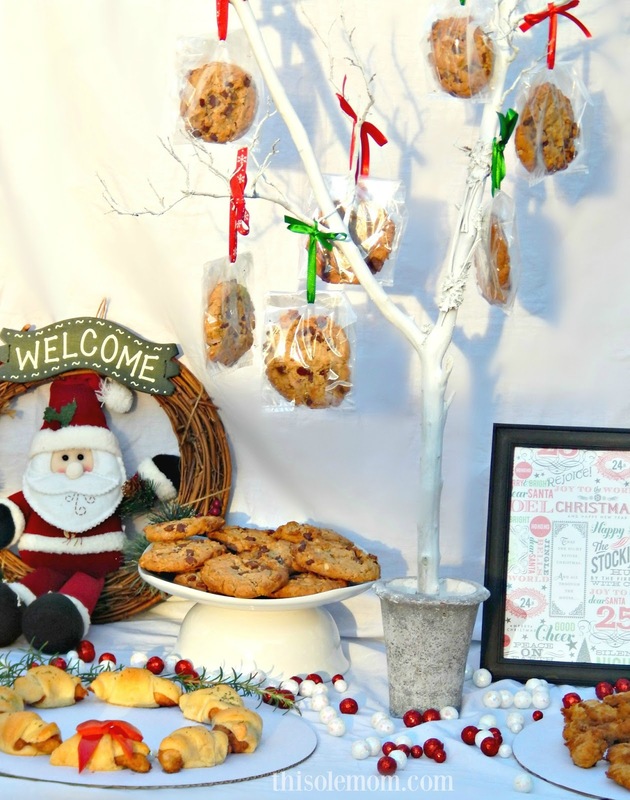 What a fun way to display dessert, especially with upcoming cookie exchanges. 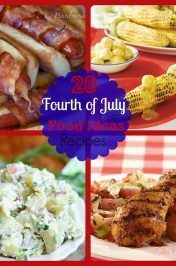 Pinning and sharing for sure! I did not know they catered. Thanks so much for sharing. Love Chick-fil-a! This is so awesome! 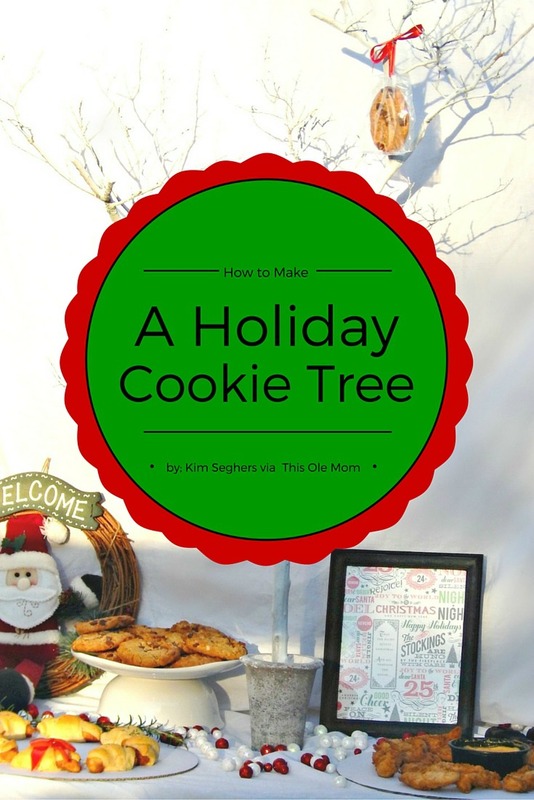 I love the idea of the Cookie Tree. What a great way to send the little ones home ready for Santa. And that wreath looks terrific. I would never have thought of wrapping the strips in the crescent rolls but it looks super yummy! The chicken strips wreath is awesome! My ds would love doing that! 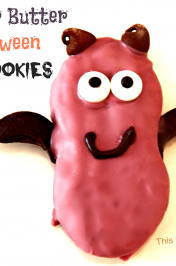 Ok, I'm really loving that cookie tree idea. Thanks for sharing. Will be pinning this! Thank you Theresa! If you have never tried Chick-fil-A chocolate chip cookies you should The cookie tree would be great for birthdays too. Have a great weekend, Kim P.S. thanks for pinning my post. You are so creative, Kim! I wish I could come to a party at your house. Love the cookie tree idea. What a great way to present cookies to kids instead of just putting them in tray. Thank you for sharing with us @ #HomeMattersparty. We would love to have again next week. This is a lovely idea. Better than getting out the whole tree, especially since I live in a small place. I think I would need to seal th e bags though – the ants go mad when they smell sweet stuff a mile away!